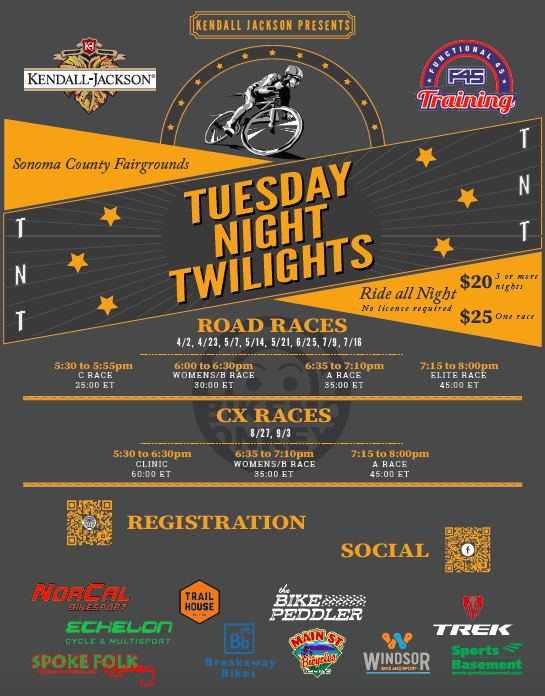 All races are at the Sonoma County Fairgrounds. In the event of rain, the event will be cancelled. Wet pavement doesn't make for safe racing. We need volunteers for this event! If you can help us run this event please shoot an e-mail to javier_sanchez@keysight.com. Registration is OPEN! Save big by buying more than one entry. You can use your entries on any of the available dates. Buy a 10 pack for big savings. The last two dates on the calendar are CYCLOCROSS FORMAT! Registration for SoNoMas opens on January 1st and is $79 per rider ($59 for the Little Piggy). For that you get stocked and staffed aid stations, a categorized competitive race environment on well-marked and technically demanding singletrack, a traffic-controlled mass-start, an amazing prize list, cash payouts for pro racers and a huge post-race meal to bring you back from whatever cave you found yourself in.